Located in the Piedmont (Piemonte in Italian) region of northwestern Italy, the city of Turin (Torino) is an important industrial and cultural center, and it hosted the Twentieth Olympic Winter Games. The Games drew 2,600 athletes from 82 nations to compete in such traditional winter sports as skating, skiing, biathlon, bobsled, curling, ice hockey, and luge. Venues for the Games included several locations within downtown Turin and the nearby Alps to the west. The first Olympic Winter Games competition was held in Chamonix, France, in 1924 with 258 athletes representing 16 nations. The image illustrates the striking landscape surrounding the city, with the snow-capped Alps visible to the west and north. The city is located on the northern banks of the famous Po River. 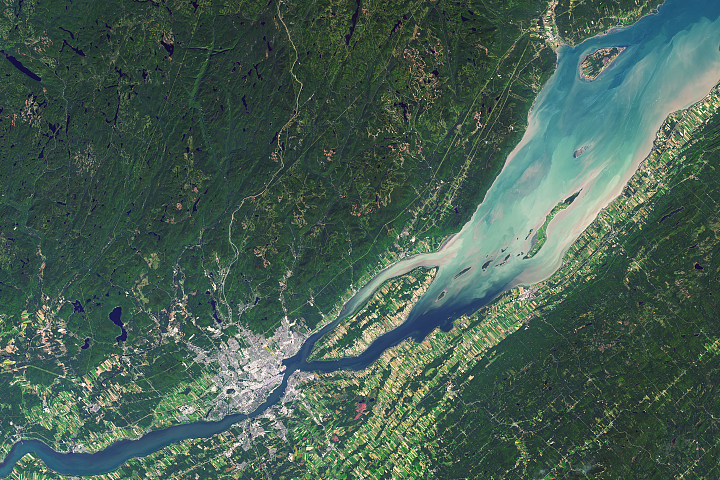 Two of the Po’s major tributaries are visible in this image, Stura di Lanzo and the Malone River. The built area of Turin appears dark grayish brown, with large building complexes indicated by white roofs (bottom image center). La Mandria Regional Park, located along the southwest bank of Stura di Lanzo, is a nature and historical preserve approximately 10 kilometers (6 miles) to the northwest of the city center. 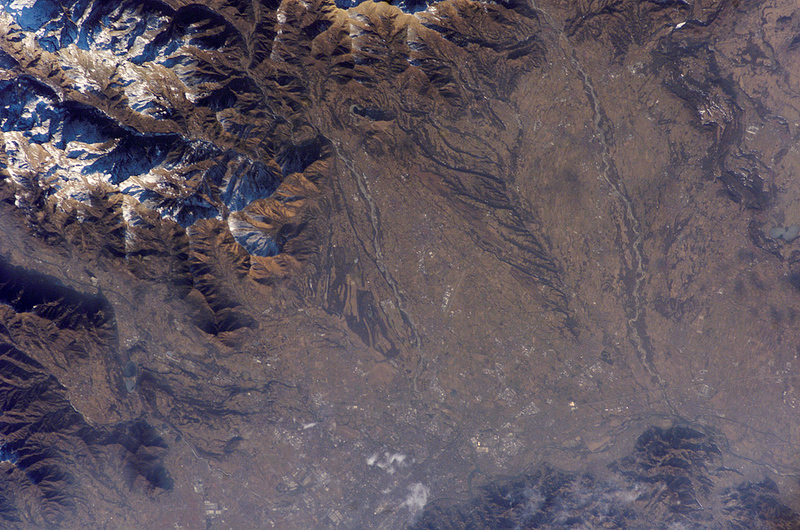 Decreasing image contrast over Turin is the result of atmospheric pollution commonly observed in the Po River Valley. 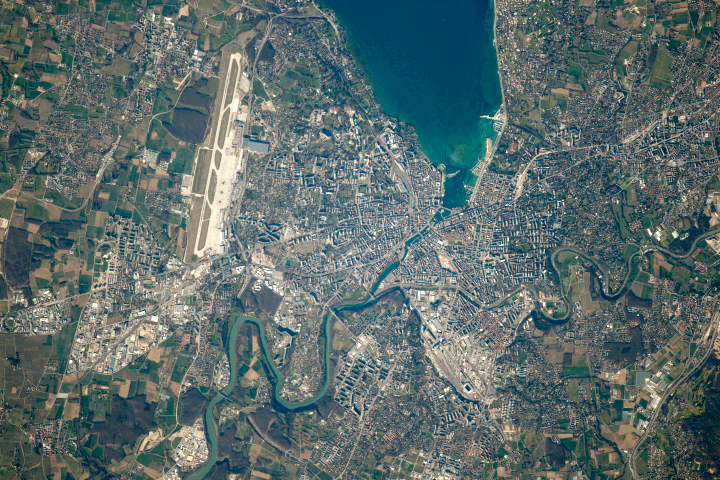 This astronaut photograph has come full circle is a sense, as several components of the International Space Station (such as the Multi-Purpose Logistics Modules) were constructed in Turin. Other images taken by the Landsat satellite and by the Ikonos satellite provide an additional perspective on the Olympic venues. Astronaut photograph ISS012-E-15598 was acquired on January 21, 2006, with a Kodak 760C digital camera using an 180 mm lens, and is provided by the ISS Crew Earth Observations experiment and the Image Science & Analysis Group, Johnson Space Center. The image in this article has been cropped and enhanced to improve contrast. The International Space Station Program supports the laboratory to help astronauts take pictures of Earth that will be of the greatest value to scientists and the public, and to make those images freely available on the Internet. Additional images taken by astronauts and cosmonauts can be viewed at the NASA/JSC Gateway to Astronaut Photography of Earth. Located in the Piedmont (Piemonte in Italian) region of northwestern Italy, the city of Turin (Torino) is an important industrial and cultural center, and it hosted the Twentieth Olympic Winter Games. The city is located on the northern banks of the famous Po River. 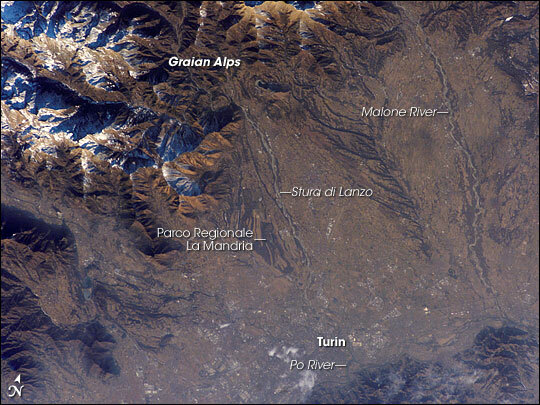 Two of the Po’s major tributaries are visible in this image, Stura di Lanzo and the Malone River.